Agents do a good job highlighting the features of communities with their listing photos these days. Instead of posting additional photos, we like to shoot a video driving around the community for another perspective. All our videos are now shot in 1080p, so jump in, relax and enjoy the ride. Square Footage: 540 sq. ft. - 1,224 sq. ft. 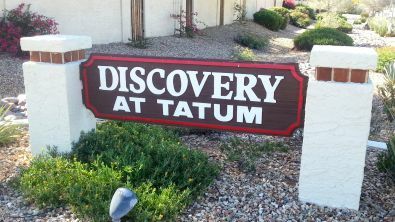 Discovery At Tatum isn't the nicest condo / townhome community in Scottsdale, but it's also far from being one of the most expensive. It's simply a good value for those looking for a home in the area that aren't interested in "breaking the bank." The amenities in the actual community are pretty scarce with a nice pool being the only thing worth mentioning. There's some grassy areas and trees throughout the complex which are visually appealing. The homeowners have done a great job keeping the monthly fees in check. They're currently $168.00 a month which is a bargain. They include water, sewer, trash, common area maintenance, roof repair, roof replacement, exterior paint etc..
One feature which is pretty unique and desirable for the area is that most units have their own little fenced backyard. This is ideal for those with kids,dogs or those that just enjoy some privacy. Perhaps our favorite feature is how walkable Discovery At Tatum is. All your basics are just outside the community. Home Depot, Walmart, Fry's Grocery, Starbucks, Del Taco, banks, restaurants - you name it.